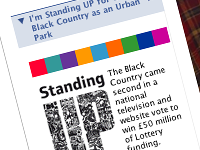 I developed and promoted a Facebook application in support of the Black County Urban Park bid for the People’s Lottery funding. The application was simple, but showed support in the user’s profile an provided direct voting links. I also produced a myspace or blog badge that did the same for other websites.